This little underground gem is literally the only reason I would ever head to Venice at night. I have been at least 5 times now and it rarely disappoints. I actually held my birthday party here this year and had an amazing rum punch bowl created…SO much better than LA club table service with ridiculously overpriced bottles of flavorless liqour. I first came here around 2years ago completely by accident. I went in during the day and was greeted by George Czarnecki, an older bartender who turned out to be a bar historian with so many stories about the location, it blew my mind. This week end, I was lucky enough to get another history talk and tour from the current manager and drinks program director Brandon Reynolds-Ristaino. The history of this venue makes it even more enticing to come visit, it is one of the few genuine speakeasys that has been family run for over 30years and there has been a bar on this premises continuously since 1915, despite prohibition. Three families have been involved in the continued operation of The Townhouse. It was first run by the Menotti family as a Buffet which opened in 1915 and the name is still visible on the original tile floor at the front of the bar today. When prohibition was implemented in 1920 the Menotti’s had grocery’s on display upstairs and moved the bar down to the basement (now The Del Monte Speakeasy). At the end of the street used to be Abbot Kinney pier (that was destroyed by fire also in 1920) In those days the territorial waters of the USA only extended 3 miles out, so Menotti had ships of alcohol come from Canada, stay at the 3mile limit then smaller boats would greet the liquor ships underneath the pier and bring the alcohol through underground tunnels to stock the speakeasy. The police somehow turned a blind eye to Menotti’s organization, which means despite prohibition this location has been serving alcohol the entire time! Pretty impressive! 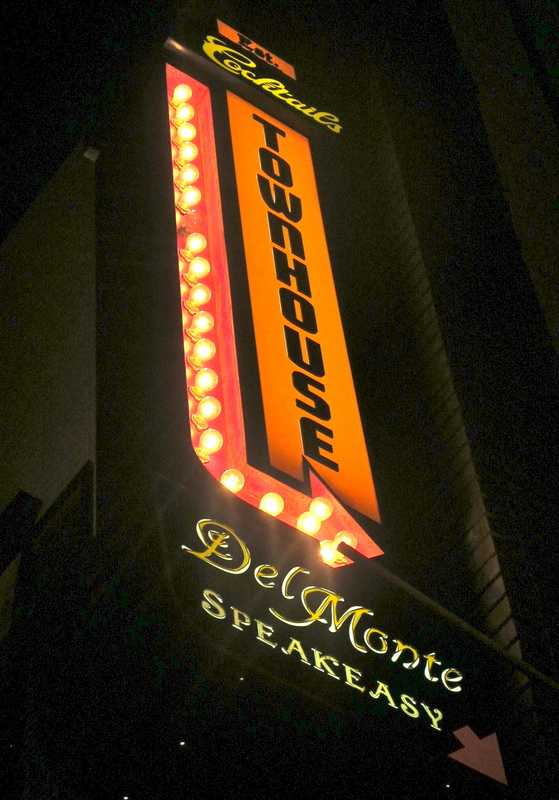 Sometime in the 1950’s the old bar’s name was changed to Grady’s Town House and in 1972 the Bennett family purchased the bar and shortened it to ‘The Townhouse.’The Ryans took it over in 2007 and rennovated the whole place, especially the downstairs ‘Del Monte Speakeasy’. I never saw the building before rennovations but I am told the Ryan’s have brought it a new lease of life and restored its legacy. On my tour of the building with Brandon he showed me where the underground tunnels used to lead to and informed me there are still caves all over the city and they recently discovered there is a tunnel that leads all the way to the ‘King Eddy’ in downtown. These caves were only filled in in areas so there are undoubtedly STILL several open caves damaged only by earthquake activity.The staircase in the photo on the left is hidden in the back of the basement, (now a storage room) but used to be the staircase that was at the end of the alley to the bar and lead inside. When going downstairs (and they’re steep stairs so be careful!) you get a sense of excitement, especially knowing the history. You feel like you are entering a secret society in an underground hideaway, there is an elegance and sophistication in this location. It isn’t a dive bar, it is a reflection of the good parts prohibition brought about like the underground cocktail culture. It is a unique experience. Music ranges in style but there is live music 3 times a week (Sundays, Thursdays and Saturdays) and they have some of the countries best muscians/bands and when the live music stops there is often a great DJ. They don’t play cheesy pop music down here though, in general it is heavy edge artists not mainstream, cultural music, and sometimes jazz. It has such a unique vibe and every guest i’ve ever brought has commented on how much they like the ambience. 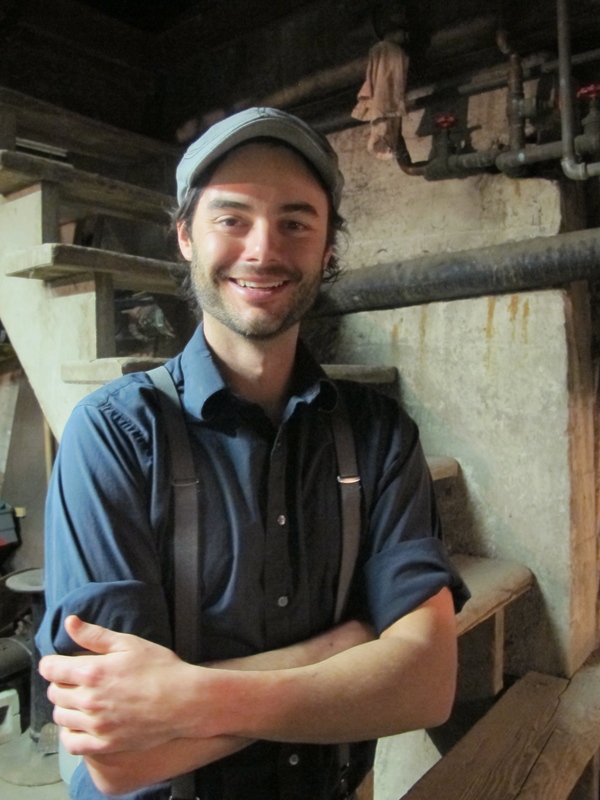 Brandon Reynolds-Ristaino (worked for 1933 group) came here 6 months ago and created the current drink program. Since he’s been around he’s really brought it back to its element. On my last visit one of the girls I was with asked for a drink with berries, I was suitably impressed when he responded “i’m afraid we don’t have berries right now, I won’t stock my bar with anything not currently in season”. He won’t break his integrity and that is always admirable! The drinks I tried were really good. The winter cocktail list is currently available and I first chose a Winter Sour and my friend had a El Volcan. WINTER SOUR– Black Pepper infused Gin, Kumquat, Honey, Elderflower and Citrus. Shaken and served up. I have to admit, I broke my own rule and modified my Winter Sour choosing Plymouth as apposed to the pepper infused gin option…I regretted this later when my friend ordered it the correct way and it was SO much better. Trust the professionals! The honey was overpowering in my version and tasted like a cold toddy, I could imagine it helping me feel much better if I got sick. The pepper gin (which I did taste and although it had a kick to it was not too spicy as i’d feared) made the drink well balanced and really interesting. The El Volcan was also well balanced and tasty, I was astounded I liked that at all because it was really smoky (Mescal) and had a bitter after taste but there was a definite sweetness to it and overall was a pleasant drink. It’s a VERY GOOD sign when I don’t like most of the ingredients but can appreciate the mix of flavors in the end result! That’s how I felt when tasting this drink. I really wouldn’t want to taste any of those liquors usually, but they complemented each other beautifully in this drink and I found myself enjoying it. I have also had the Morricone here, which again was balanced and delicious. The chocolate chili bitters were subtle, but added an aromatic element to the drink which I enjoyed thoroughly. I think Brandon has done a great job creating a list that appeals to all, there is a great range of his own creations but still a list of classics that are all executed correctly, like the orignial Sazerac. All in all, you won’t be disappointed with a trip to this bar. The culture and history of the place will make you want to dress up in 1920s attire (and i’ve seen many visitors do this with themed parties) and the drinks are tasty and well thought out. Check out their website here for current events, I am told they have an ‘artists night’ when artists paint large canvas’ during the course of an evening, and ‘burlesque nights’ although I have never been to either i’m sure they are great! 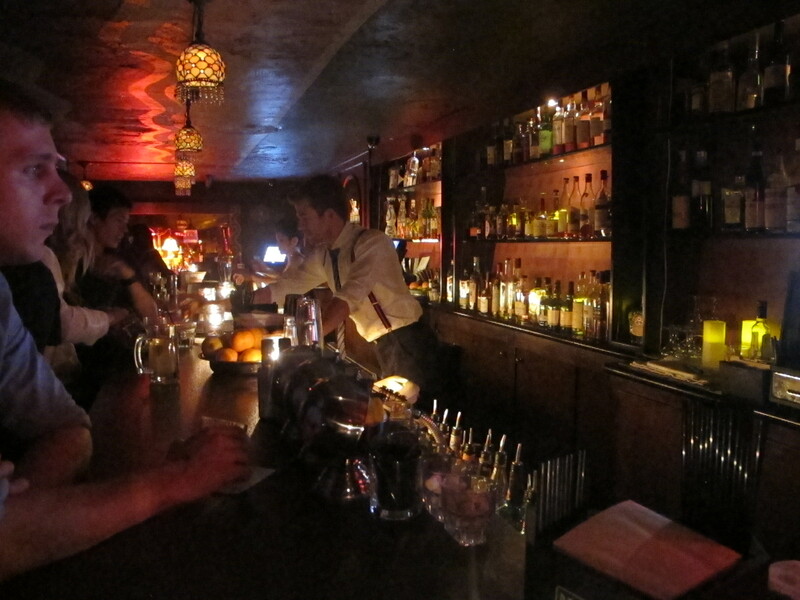 The drinks I tried were all well balanced and prepared correctly, the bartenders are always ready and willing to create you something great off menu if you need and the ambience is like nowhere else on the west side of the city. Brandon is a pleasure to talk to and really knows his stuff. This place looses a point purely for the mechanics of the place and by no means for the cocktails themselves. The music on a few visits has been too loud through the speakers, the place gets crazy packed on some nights making it hard to dance and sadly the “attitude” of our particular cocktail server that evening really did it. I really believe (having been a cocktail server myself) that it isn’t JUST about taking orders especially in a place like this, it is about selling people on the list of drinks available. The owners chose to hire a bar consultant, then Brandon came in and created a wonderful cocktail list, but the server I talked to didn’t try/know how to sell me on any of them! When I asked “Is the Sazerac here good?” she responded “I don’t know” without a smile, when I said “oh ok…have you had this?” pointing to the ‘El Volcan’ she replied “I haven’t had it… I don’t like Mescal”. Obviously, this was one server, maybe having a bad day and i’ve never had an issue with the others there or the bartenders but the ‘old me’ (read the About me section to understand) would have just reverted to ‘i’ll have a vodka cranberry’ because it’s easier than trying something new and that totally defeats the object of a place like this.